2.48PM : Innity Advices publishers not to load their ad script until they inform you to do so. Last night i was trying to access petalingstreet.org but a different page appeared warning me that the site contains element which host malware. A few hours later i saw someone tweeting that blogs/sites that have Innity Ads were all flagged as sites that might harm your computer by Google itself with Malware Attack Warning. I searched more and found out that there were already quite a number of people complaining about it on Twitter and apparently, this problem exist since Malaysian Time (GMT+8:00) 5pm, September 19th 2010. 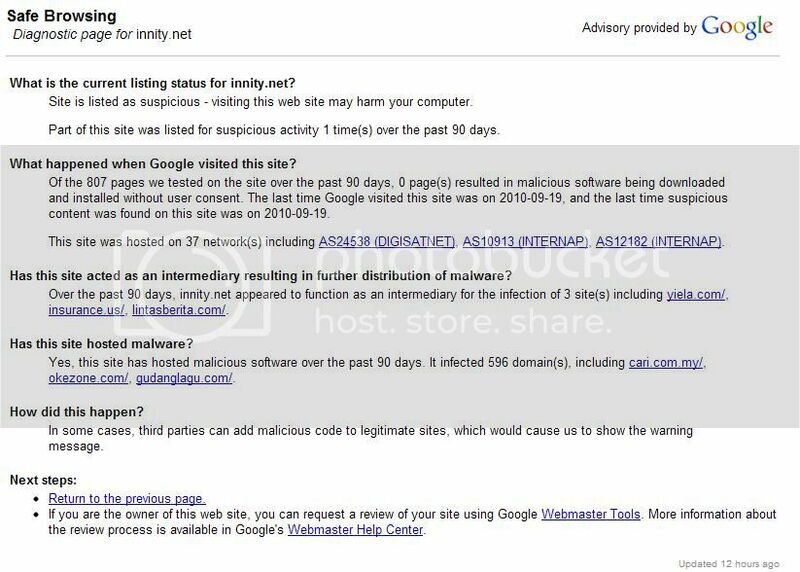 Over the past 90 days, innity.net appeared to function as an intermediary for the infection of 3 site(s) including yiela.com/, insurance.us/, lintasberita.com/. Yes, this site has hosted malicious software over the past 90 days. It infected 596 domain(s), including cari.com.my/, okezone.com/, gudanglagu.com/. The diagnostic report stated that innity.net indirectly got the malware through 3 sites which includes yiela.com, insurance.us and lintasberita. There are 600+ domains which have Innity Ad codes affected in total and that includes sites like cari.com.my!! Then again, i remembered that TheStar.com.my do have Innity Ads as well. Another safe browsing diagnostic search leads to this print screen below which verifies that TheStar.com.my was one of the 600+ sites affected with ad codes from Innity. LowYat.net have reported that TheStar.com.my was marked as site with Malware on the 15th of September and that time Innity.net isn’t one of the cause yet. I believe that the tech team behind TheStar.com.my removed all the Innity Codes when they found out about it in the last 13 hours. You can access thestar.com.my at the moment. However there are still hundred of sites which is currently marked as domains with Malware by Google and this warning will only appear if you access the sites with Firefox / Google Chrome. Here are some of the sites that is affected by this Malware. If your site have Innity Ad Codes in it, do remove the codes by following the instructions above and you can check whether your web site has been cleared here. At the mean time, there is no official announcement by Innity on this matter. Please view on top of this post for latest updates. Thanks! We are aware of the current issue one may be facing with the Innity server and our technical team is working to get this rectified ASAP. If this issue is causing any inconvenience to your website/ the website of anyone you know, we suggest that you temporarily remove our ad scripts until further notification from our end. 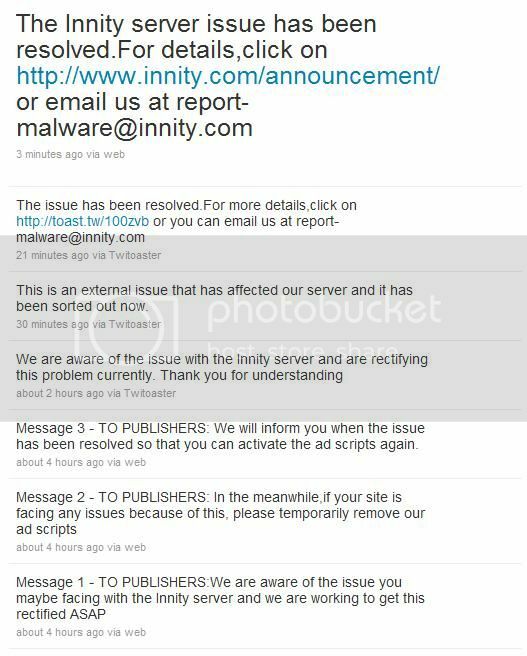 We sincerely apologize for the inconvenience caused and look forward to your continued support to Innity. Same person but two different post. How come the comment time is 1 year ago one? omg. I received that warning a lot of time and ignored it. yes, i am an idiot, thank you. fully qualified Psychics and Senior UK Clairvoyants. thhink that it would be a masterpiece or just stick men.